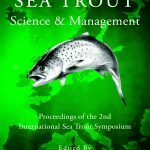 Please use the form below to register for the 2nd International Sea Trout Symposium. Payment details will be taken over the phone. Note that the closing date for registration is 5.00pm, Monday 5th October 2015. Payment can be made by Visa / MasterCard etc or Bank to Bank transfer by Contacting Sandra.doyle@fisheriesireland.ie for further instructions. Please mention Inland Fisheries Ireland when making a reservation.